Armed with a crackling Warpforged Blade and a ruthless cunning, the Warlord of Clan Izzitt seeks to plunder the mortal realms for precious warpstone and slave-things to experiment upon. Since we started to blog here at Technasma, I’ve drawn great inspiration and energy from the online community of hobbyists. The support, positive feedback and praise that we’ve received has been fantastic. But furthermore, the many painting contests that are regularly run on social media are a great excuse to start a new mini-project and try something new. 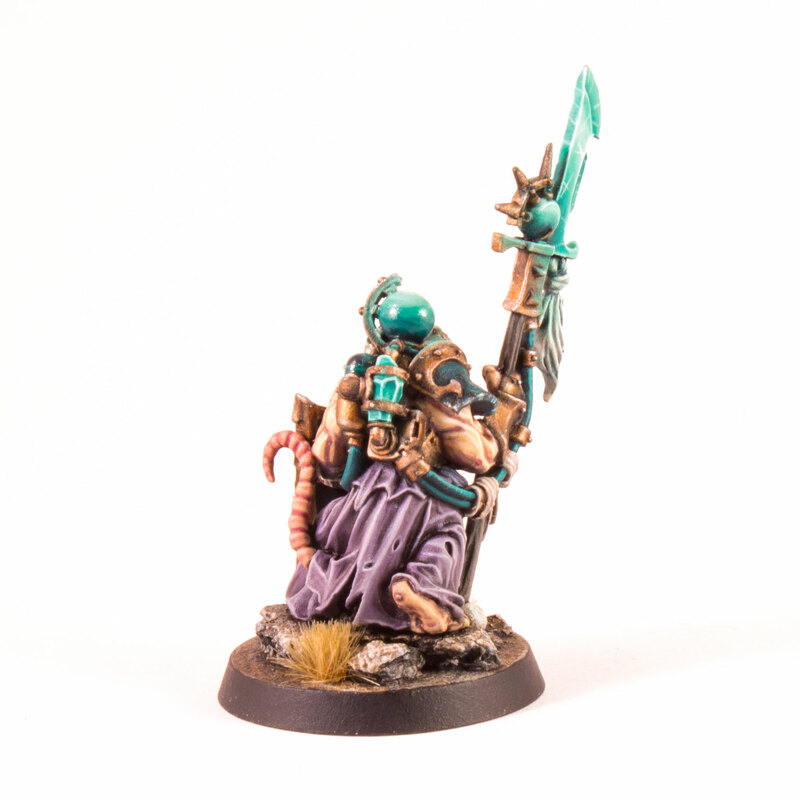 Regular readers may remember the Masters of the Deep figure I entered in a contest on Instagram, and this Age of Sigmar Skaven Warlord is another competition entry from a few months ago. As a one-off project I elected to try out some new colours and focus on painting techniques that I want to improve. 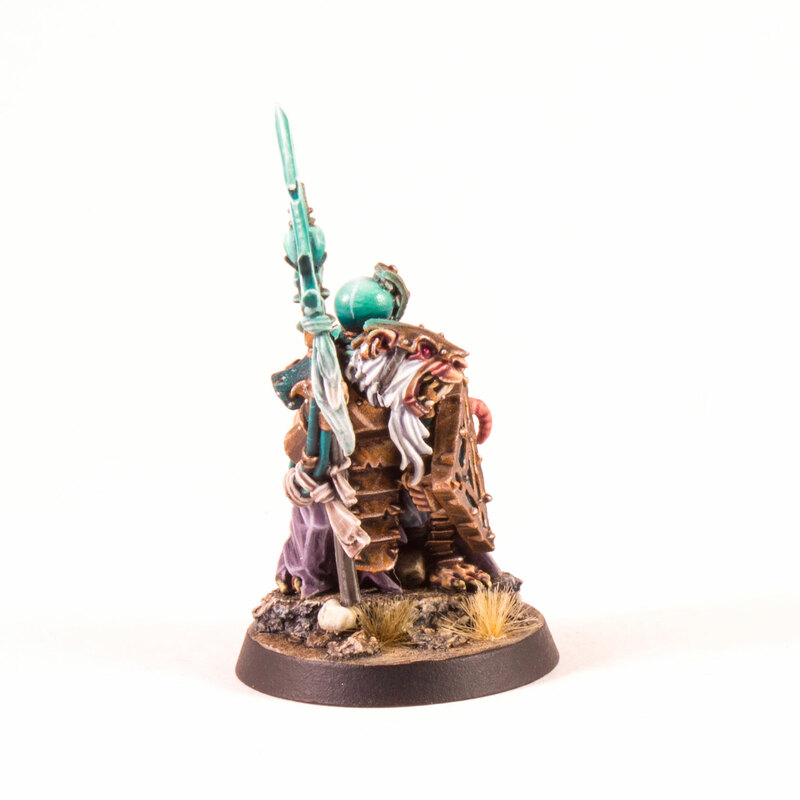 I’d bought the excellent Games Day Skaven Warlord a while ago and this was a perfect opportunity to do him justice. As with all of Seb Perbet’s miniatures, he oozes character and is beautifully sculpted. I’m a big fan of the eccentric, steampunk blend of magic and science that the Skaven have going on. I used a similar palette to my Aelf Realmscout with jade greens and desaturated lilacs and purples. I just love these colours at the moment! This was complimented with rich bronze metallics for all his armour and arcane devices. I think that the jade green looks quite effective, compared to the usually more sickly, emerald-green you see on Skaven warpstone. Clan Izzitt is a splinter faction of the powerful Clan Skryre. These albino-furred pack runts have risen to power by mastering the voltaic essence of warpstone and using it to power their weapons of war. Now this clan of warlock mercenaries is highly sought after for their sorcerous ingenuity. I pre-shaded this miniature before painting, and built the colours up with vibrant glazes. To pre-shade, I painted the miniature black all over, then used a grey Humbrol aerosol primer to spray from above at a 45° angle from above. Finally, I used a can of Skull White to hit the very top of the model. 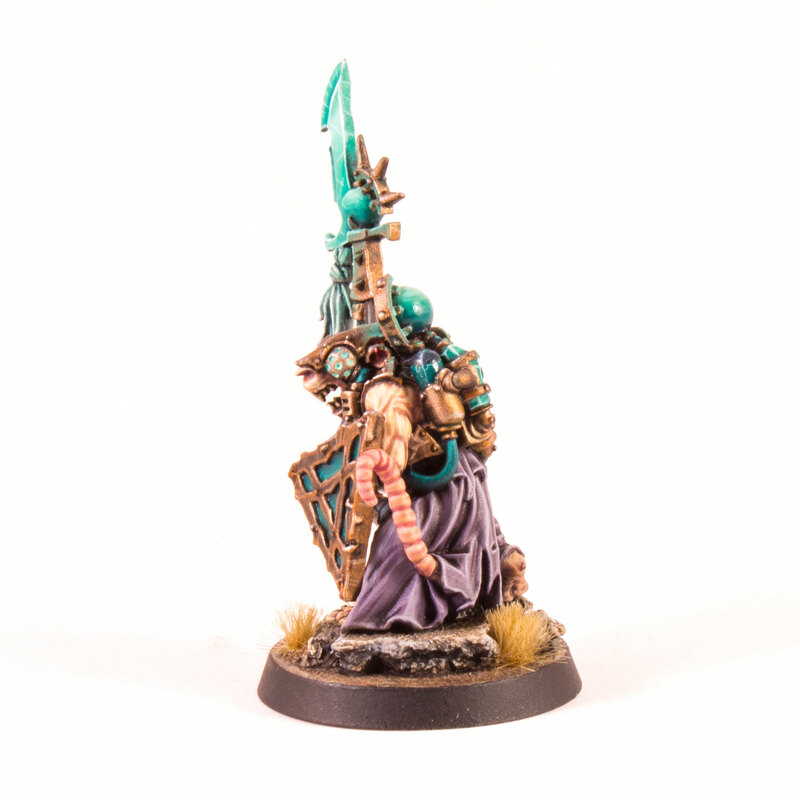 This zenithal highlighting technique makes the model appear to be lit by a light source above it and creates some nice gradients to layer the colours on top of. You can see this at work on the Warpforged Blade, which only needed a few light applications of the various hues of jade in order to colour. There were some truly excellent entries in the competition and I didn’t win, but like all villainous Skaven Warlords I will be back with a vengeance for the next one! You can see some of the excellent entries by looking up #amysnuggspaintingcontest on Instagram and see the phenomenal winner by Craftworld Studio below! What do you think of my Skaven? 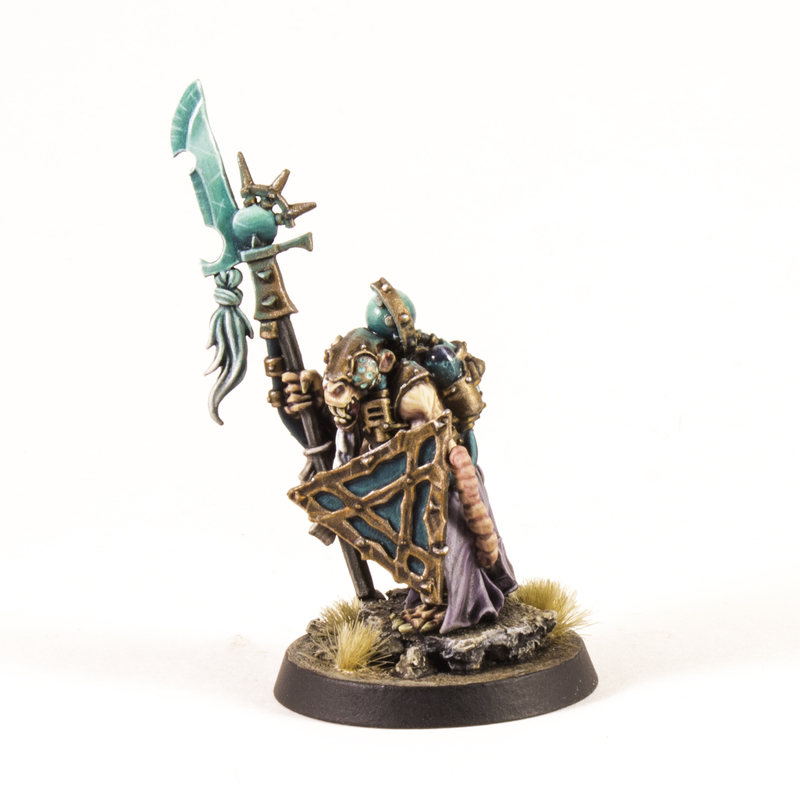 Have you entered any competitions online with your miniatures? As ever, please feel free to leave a comment below! 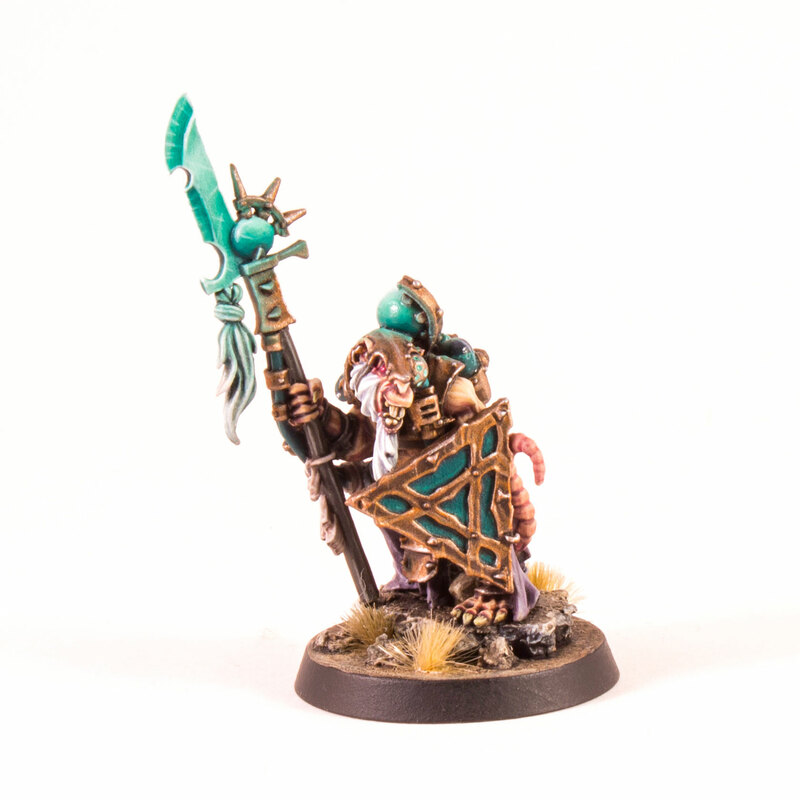 This entry was posted in Colin Price, Showcase and tagged #ageofsigmar, #warmongers, Age of Sigmar, Chaos, Colin Price, Glowing Weapons, Non Metallic Metal, Skaven, Technasma, Warhammer. Bookmark the permalink.